Feature Story Artist at Large. Magic is real. No one know exactly how it when it happened, but it's a tangible force that can be felt, measured, manipulated and sometimes, rarely, controlled. Mojo is an animated YA urban fantasy about a young runaway girl who becomes an uncommon hero in a city corrupted by the sudden emergence of magic into the world. She’s got “the Heat", but is she strong enough to survive the streets and stop the baddies? Luckily, she has a new partner in crime, a 7-foot tall cement statue with a soul. It's been 5 years since the first publicly documented magical incident, and the world has been changing ever since. No one is sure exactly when or how it happened, but magic is now a modern day reality. And as with anything misunderstood or feared, it hasn't exactly been embraced by the general public. A volatile and unpredictable art, it's only practiced by the select few gifted (some say cursed) to wield it. Indeed, Magic has been fully embraced on the streets where gang members, black marketeers, pushers, and hustlers use whatever they can to gain an edge. As with money or drugs, magic in the wrong hands can be a source of corruption, making the world of Mojo a darker, grittier, and more dangerous version of your typical magical fantasy. Think Harry Potter meets Gotham. Creepy is a runaway street witch living off her wits and magical talents. She's a stubborn and spirited, living life on her own terms. This attitude tends to get her into trouble more often than not. But even her tumultuous life is flipped on its ear when an extremely powerful artifact literally drops into her life. A huge 7-foot tall cement golem falls into the alley where she's being attacked by a street gang and rescues her. It has no memories, no idea of its past or its origins…just the feeling that something is not right. At first Creepy wants nothing to do with it. The laws on magical animation are very strict (think drug trafficking in terms of sentencing) and she's never seen anything like this golem before. No one has! She tries to get away from him, but it's not long before she ends up in trouble again. After another timely rescue she decides to help the golem which she names Mojo. As they start looking into the Mojo's origins, it isn't long before they draw the attention of a powerful magical organization called "The Brokerage.” They deal in black market magic, claiming that Mojo is 'their property' and they want it back. Head strong and spirited, Creepy discovered she was gifted in magic when she was a young girl. She landed in the foster care system after her father was killed in a magical incident between her and a powerful spirit. After running away to escape foster care, she joined a coven of street witches led by an witch named Mother Yu. After a fallout with her coven Creepy struck out to pursue magical training on her own. Creepy seeks to learn the most powerful secrets that magic has to offer as quickly as possible. She wants to use magic to break the barrier between life and death to reach her father and bring him back into this world. She naively believes that then she can return to the life she used to have. Mojo is a disembodied spirit, a recently departed ghost that's been trapped in a magical gem and encased in a cement shell. He has no recollection of who he used to be or how he came to be in his current body. He not even entirely sure he's human. In life his name was Matt Landry, a police officer with the Magical Crimes Unit. He was mortally wounded while investigating a Soulcraft crime (crimes of magic involving manipulation of the human spirit.) and his partner placed him in the contraband body to save his life. While his memories may be gone, he's retained much of his defender spirit easily putting himself in harms way to help those that can't help themselves. 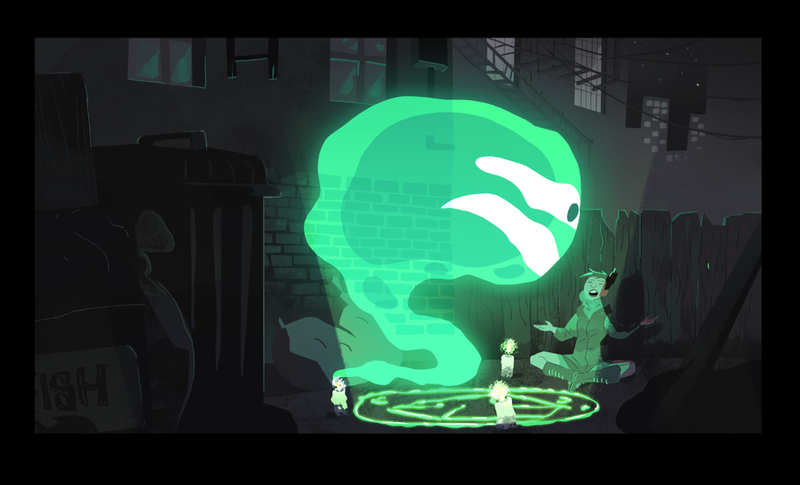 Thales is a minor spirit of the city that's been summoned and trapped in a rat's body to act as a familiar for Creepy. The origin of the spirits of nature is unknown. Some believe they form naturally, their demeanor influenced by the domain that gave it its existence. Thales could care less. The city is all he knows and all he's ever known. He existed free for centuries and he hates the idea of being imprisoned and commanded. For now he's willing to suffer being under her rule. But he's constantly looking for the opportunity to escape his bonds...and make her pay for it! Mother Yu is the head of a coven of witches known as First Sisters. She is the founder and elder of this group which she set up to teach young girls with magical talents the Arte. She focuses mostly on defensive spellcasting and hexes. Her belief being that "one must build a strong foundation before diving into the deep mysteries of modern magic." While her philoshies and goals are enlightened and altruistic now, they weren't always so. As a founding member of the Brokerage, she once sought to exploit all the Arte had to offer. Whatever incident caused her sudden change of philosophy is between her and the Brokerage. For now she retains a live and let live policy with her former associates. Dipdi is one of Creepy's closest friends and allies. She was the first person Creepy met on the streets and she led Creepy to the Sisters and Mother Yu. They haven't talked much since Creepy left the coven, but when they do Dipdi always tries to talk her into returning to the Sisters. For all appearances Chuckles is hip, well dressed African American male of medium height and muscular build. But those "In the Know" see him for what he is, a very powerful, very old Spirit of Nature. He... It has acted as an advisor and helper to Mother Yu for years. But where Thales has been enslaved and forced to help Creepy, Chuckles has agreed to help Mother Yu of his own volition. It comes and goes as it pleases, but always seems to show up when Mother needs him the most. Every group has their "crazy-man" and Loco is the Demon's. She found a place with the Demons by finding their biggest rival and biting his ear clean off. Yeah, she's just that crazy.